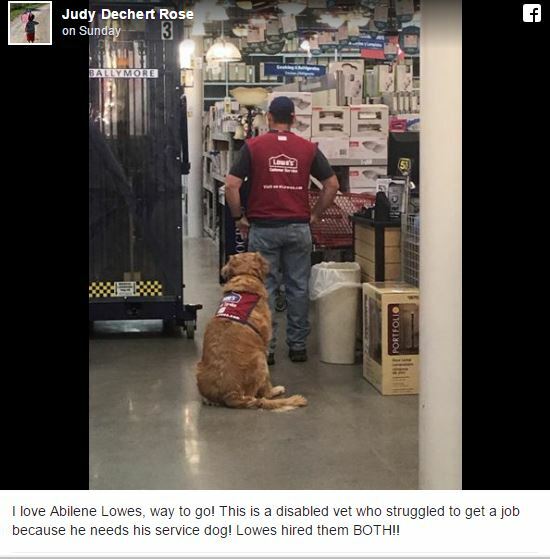 Jay Fellers is a human resource manager at Lowes in Abilene, Texas. He was told that a disabled Air Force veteran, Clay Luthy, was unable to work without being accompanied by his service dog, Charlotte. Instead of throwing Luthy’s application in the trash, Fellers pulled out another application and used it to offer a job to both Luthy and his trusty service dog, Charlotte, a job. Both Charlotte and Luthy were offered part time positions at the popular home improvement store. Charlotte is not only allowed to accompany Luthy for the entirety of his shift, she also received an employee smock of her very own. A photo of the duo at work was taken and posted to Facebook. The photo went viral overnight and propelled them into viral internet superstardom. The hiring has been a resounding success for all parties involved. Luthy and Charlotte have proven to be reliable workers during their two month stint at Lowe’s and have no plans of leaving. The duo are often assigned to the paint department where Charlotte has room to sit and Luthy can address customer’s needs with Charlotte only feet away. Charlotte has also been a hit with customers. Judy Dechert Rose, the woman that posted the viral photo, is one of many customers who were delighted to see the pair in action. Luthy is currently keeping busy by working part time at Lowe’s and training his new service pup, Lola, to take Charlotte’s duties when it’s time for her to retire.